Less witty than usual, this post is just a bit of housekeeping for you. I just noticed that the blog had no “Archive” section on the home page, making it really difficult to go back and find an older post. I noticed that because as I was watching the sun rise across the cabin port this morning and sipping my tea (now sadly depleted), I found myself wondering where we were one year ago? Partly that’s because it’s damn cool this morning – 56 degrees with a 10 knot breeze feels COLD when you’d gotten used to 70’s & 80’s. So I’ve added an “Archive” section to the blog. That means that if you want to know what the crew of Sionna was doing in -say – October of 2016 (Hint: it involved lasers and eye patches and gooey pastries!) you can now easily check it out! Cool. Thanks for coming along, ya’ll! The first week back is bound to be interesting. 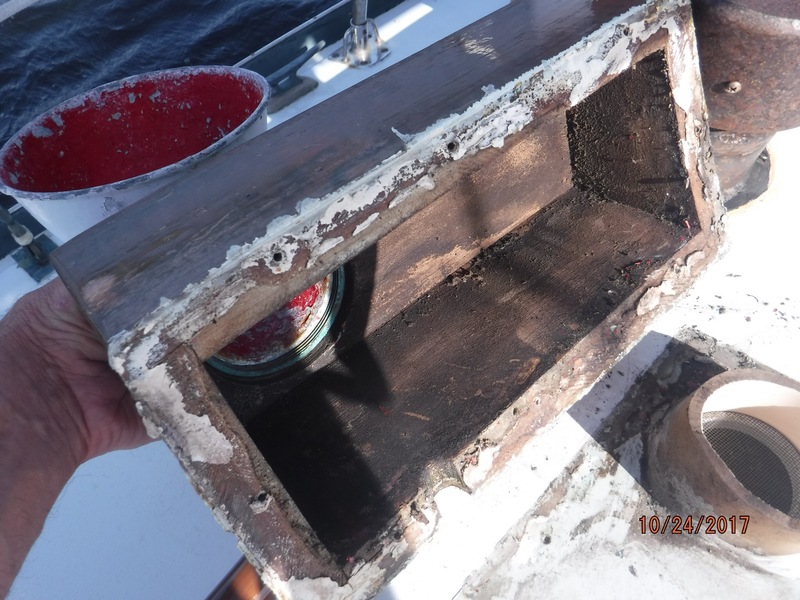 Realistically, you can’t expect to walk away from something like a boat or a house for five months, in a hostile climate, and not have a few issues to deal with when you start to use it again, so we expected a few surprises. Basically, though, Sionna woke up and went right back to doing what she does best – taking care of us. 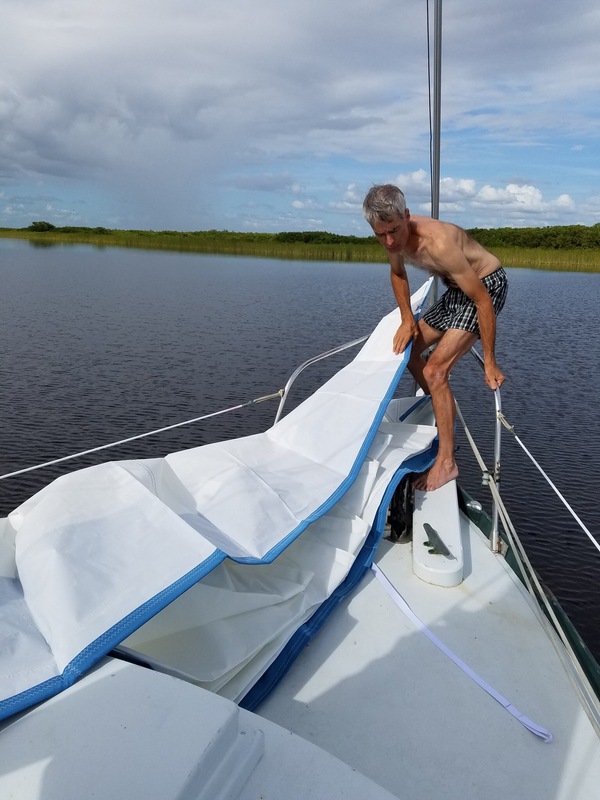 So in the week or so since we launched from the boat yard, we’ve slept every night and eaten every meal aboard, plus we’ve sailed a grand total of 27 miles – from the yard in northern Charlotte Harbor to an anchorage called Pelican Bay, just off Cayo Costa State Park. 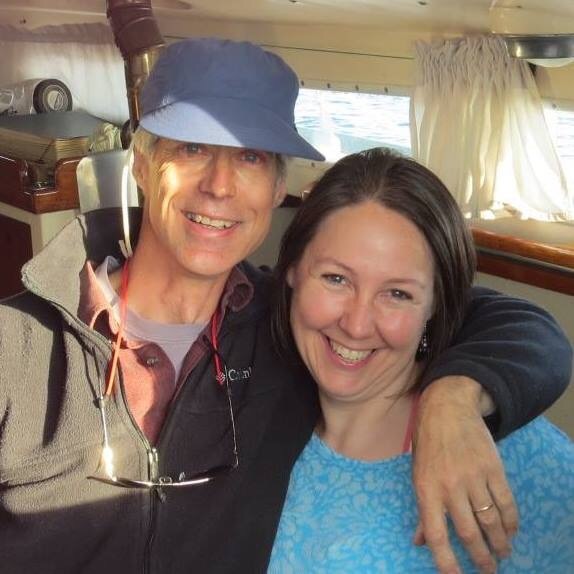 That week has confirmed one critical, enormous, wonderful fact: We love our boat! After we were launched last Thursday, we filled up the water tanks at the dock, (the diesel tanks were filled in the spring for storage, and the propane tanks were topped off before we re-installed them in the yard) said goodbye to Nicki’s incredibly patient and helpful parents, (who hosted us in their home and loaned us their car for the 8-days of recommissioning work) and motored out the canal from the boat yard to the man-made lake that feeds the canal – about 3 miles. There we set the anchor and settled in to re-learn boat life. How to move, how to sleep, how to cook. All the little peculiarities of living in a tiny home afloat came back surprisingly quickly. And with those skills came contentment. We were home. Yes, I recognize that the sun also appears to settle below the horizon where you live too. But sunsets on a boat are different. They last for an hour, sometimes. They begin in the west, but then they spread across the sky, until frequently we have a 360 degree sunset, like this one. Oh, and don’t forget the second sunset! Just as the initial glow is fading, round two kicks in. Pour another spot of wine and relax – you’ve got nowhere to go. Anyway, after a couple days there, and having done all we could think of to make the boat ready to sail, we hoisted the anchor again and started north to exit the canal. 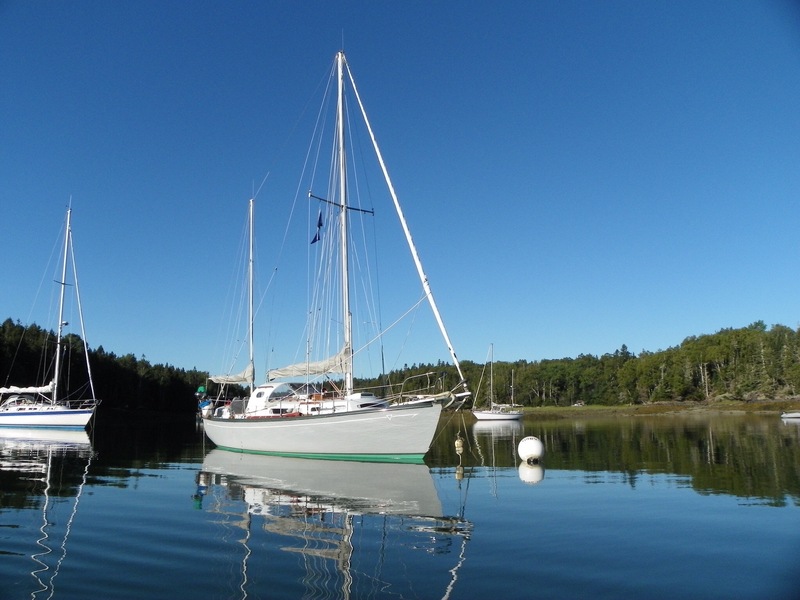 We actually managed to sail a good portion of that trip, the wind being favorable, and discovered immediately that our one major purchase of the summer was totally worth it. The new sail ROCKS! 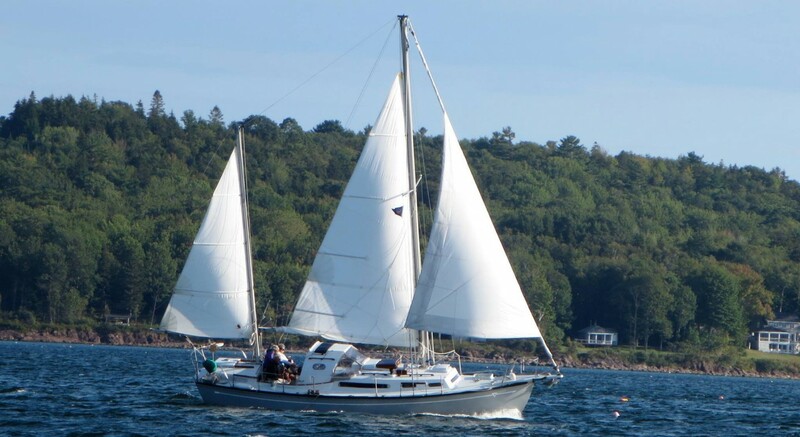 Two years ago we were told by a sailmaker back in Rockland that our headsail (or “Genoa”, because of its size) was on its last cruise. The fabric was too stretched to hold a proper shape or to be repaired should it rip. And sure enough, by May when we left the boat, you could see daylight through every stitch, and we were moving slower and slower in a given wind… our 13 year old Jenny was tired. So we worked overtime during the summer, and had a brand new replacement sail made in Indonesia, which we brought with us on the trip back south. 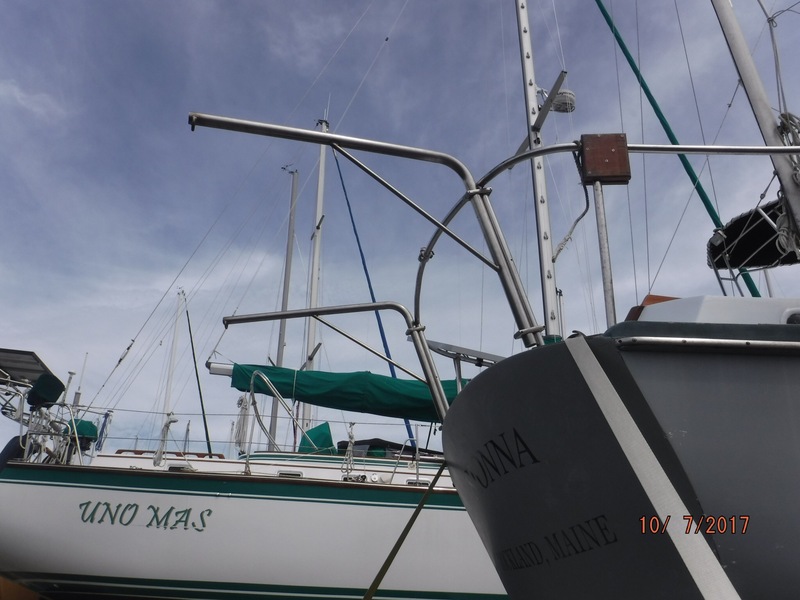 When the wind settled down briefly one evening while we were anchored out in the lake we installed and rigged it, and once we started moving, we unrolled that big piece of expensive cloth into a fresh breeze, and Sionna stepped out like a scalded cat. Marvelous! And that’s how things are, so far. Little steps, one day at a time, and face the tasks as they arrive. We’ve made a list (a rather long list) of food and condiments and such that we wish we’d brought aboard already, so the next time we have a chance to provision, we’ll do better. My list of projects to tackle isn’t getting shorter yet, but it isn’t getting longer either. I’m holding my own against entropy, so why complain? Categories: Boat maintenance, Cruising, Equipment, Living aboard | Permalink. Yes, it even rains in paradise. But rainy days are also good days. It’s relaxing, that patter of rain on the awning over the cockpit, the realization that it’s one of those days when even the ducks are walking, and “…you ain’t goin’ nowhere”. But there are projects, of course. One of the books I brought with me to the boat this year is called “The Rigger’s Apprentice”. As you’d expect, it’s a mighty tome, hard covered and 400 pages of pretty much anything you could want to know about rigging, lines, knots, etc. 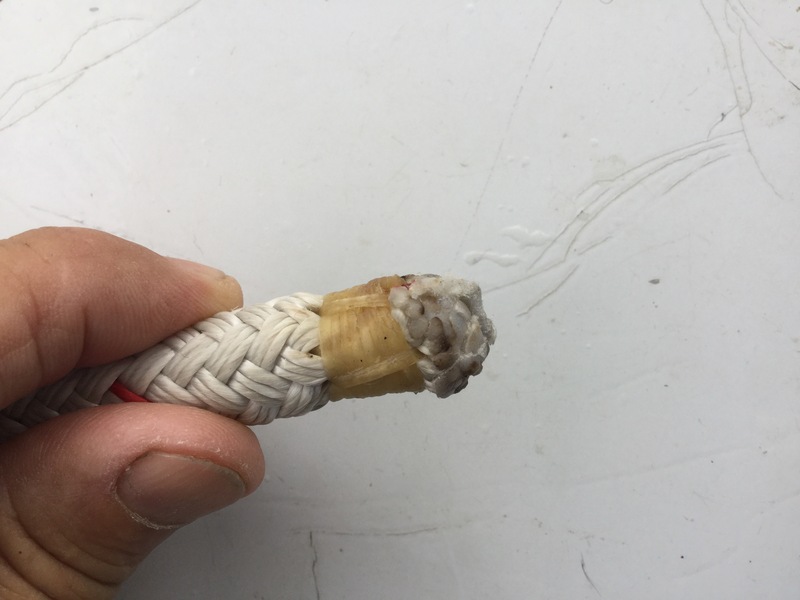 Including how to “Whip” (secure with string) the ends of your heavier lines aboard, such as halyards, sheets and dock lines. But we’re anchored off a wildlife preserve at Sanibel Island, FL, where the dolphins, brown and white pelicans, Great & Snowy Egret, Herons of several types, Rosette Spoonbills and Terns come to feed, the mullet jump like show horses, and the Ospreys lord over it all. It’s a nice spot to work on my marlinespike seamanship. There’s a known paradox in the cruising world relating to work lists – particularly those that relate to preparing a boat to launch. Those lists get longer the more you do. So now you’re not vacuuming any more, you are now giving the entire inside of the boat a scrub with Mold & Mildew cleaner, and that easy half-hour vacuuming job has become a 5 day, 25 person-hour marathon with even money on whether the knees and shoulders or the mold and mildew give out first. That’s cruising. And just to add spice to the recipe, it’s 90 degrees outside the boat, 105 or better inside, and the humidity is 98% here in the Florida swamp… Oh yeah, that’s cruising. But you know, that’s also cruising, in a positive way. It’s warm, yes, but we aren’t looking ahead to snow and ice in a couple months. The boat looks better, it smells better, and Nicki is breathing a whole lot easier with that crap gone from the walls. Just to wrap up our first week back in Florida: So far we’ve spent 5 days at the yard. 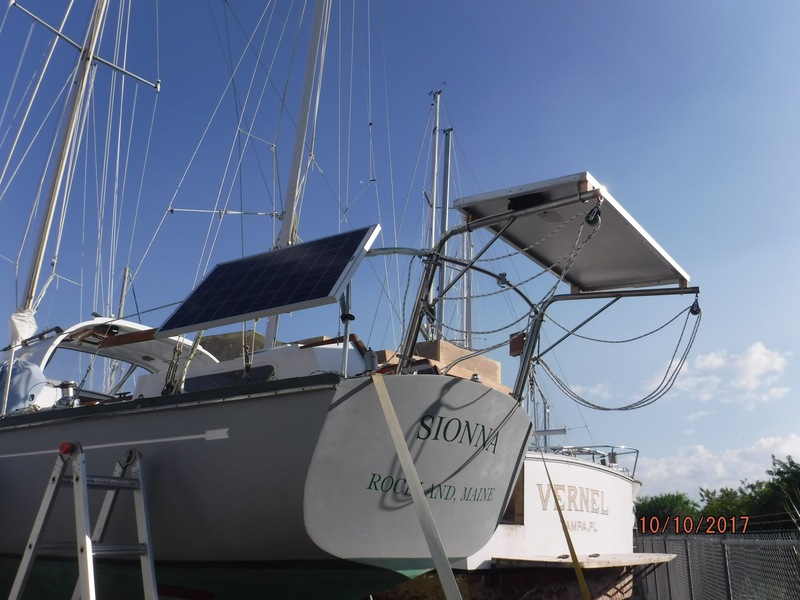 The first was just to assure ourselves that Sionna weathered the winds of Irma ok, and in fact she suffered absolutely no damage from the storm. I think that’s pretty amazing, considering that the winds were between 80 and 110 mph for several hours. She was filthy, yes, with all the dust kicked up by the storm, so our first work-day was spent scrubbing the decks and cockpit so we wouldn’t be tracking all that stuff into the boat. Day two (and mind you, a day is about 4 hours of actual work for each of us. At these temperatures, that’s about all we have in us) I sanded and painted the propeller, installed the bilge drain plug (that one is pretty important!) and started installing the new dinghy davits, while Nicki began cleaning the interior – bow to stern. Day three was more davits, finding materials, and more scrubbing, plus swapping in a new spinaker halyard so that the old one could become the hauling lines for raising the dinghy into the new davits. Oh and cleaning. 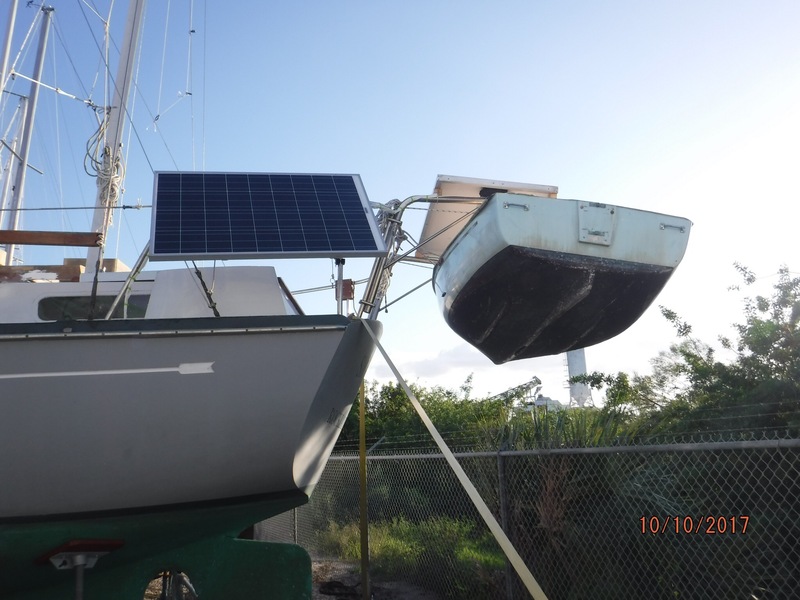 Day five, which was yesterday, included installing new carpeting to the walls in the aft berth, mounting the solar panel, running the wires and hooking it up (we’ve got gobs of power now – 220 watts of solar! 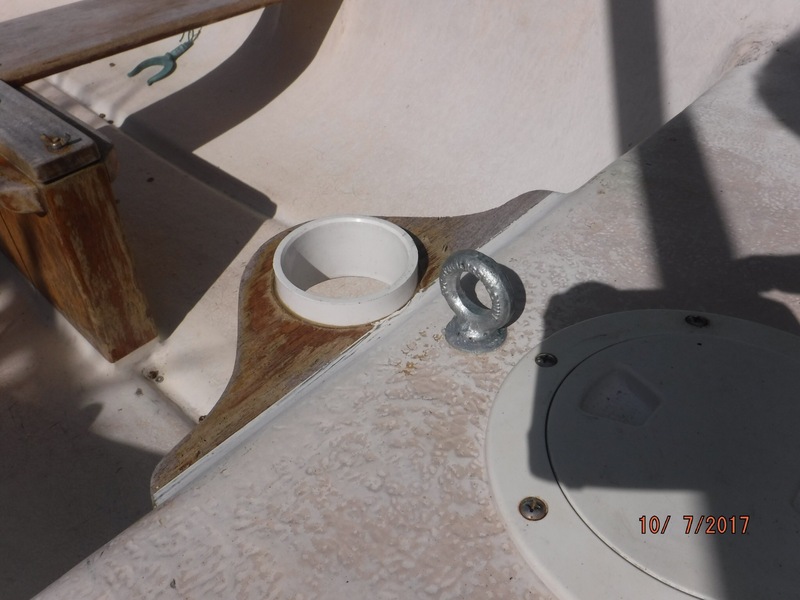 ), and hoisting the dinghy up into the davits for the first time, just because we can. Yes, and cleaning. All told, our first week of boat work has involved about 55 hours of labor input. If we were paying normal labor rates to have someone else do it, that would be about $4400 already. This is why we say the reason we can live this lifestyle is because we aren’t afraid to DIY. It’s also why – when someone says “I want your life, but I could never afford…” – we say yes, you can. You just have to be willing to sweat a little. Oh, and that worklist? I started with 11 items. This evening I’m sharing a post from one of the many cruiser blogs we follow. Partly because I enjoy their stories, but mostly because Grenada is one of the places I’ve been reading about since I got interested in cruising. Someday, we’d like to go there ourselves. It’s not a quick trip. 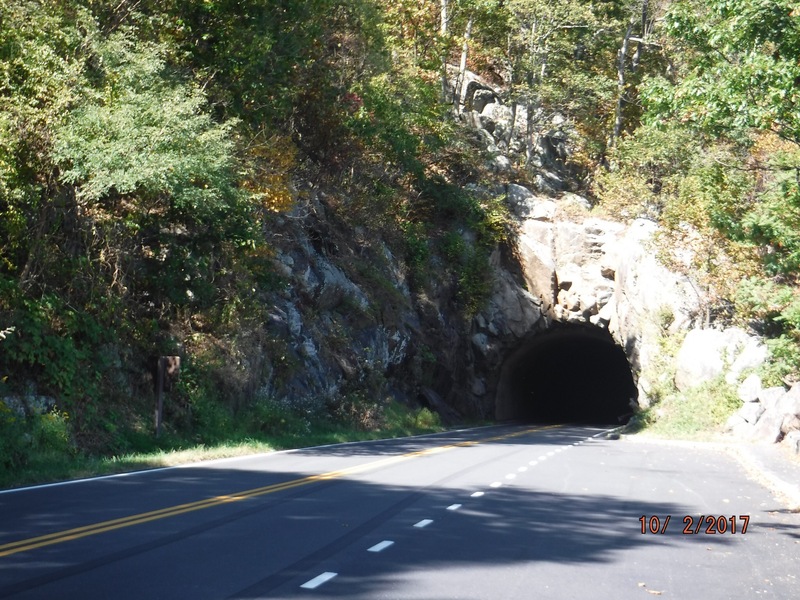 There are actually several ways you can drive to Lynchburg, VA from Hazelton, PA, but there’s no slower way than the Skyline Drive – so naturally that’s the way we went! But there was a reason for that. 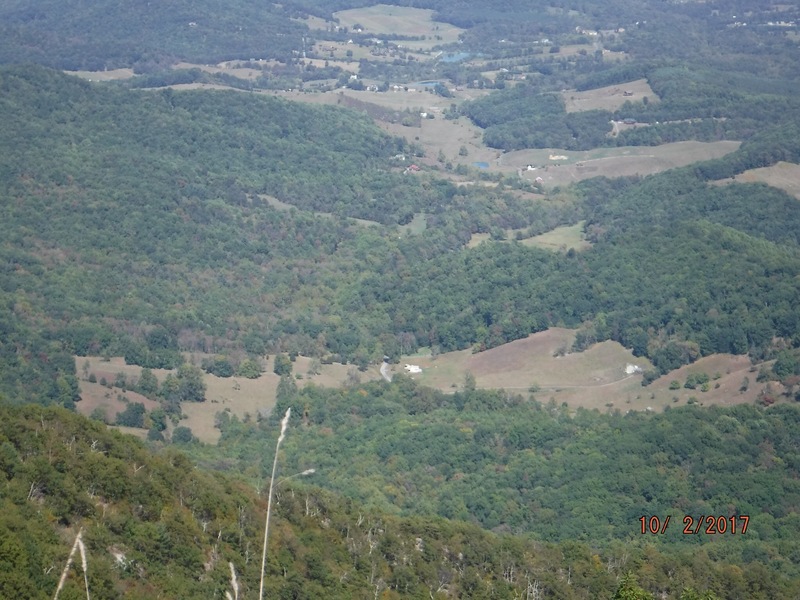 A little hard to pick out, but this photo is taken from a lookout at an altitude of about 3000 feet – or roughly 2000 feet above that little farm you see down there. It’s pretty cool. So that was day 3. Day 4 began with a 9am departure, but we covered a good bit more distance, since we weren’t in “sight-seeing” mode. Too, once out of the mountains of Virginia, the roads straighten out and level off, making for some serious miles made good. And look what we found! 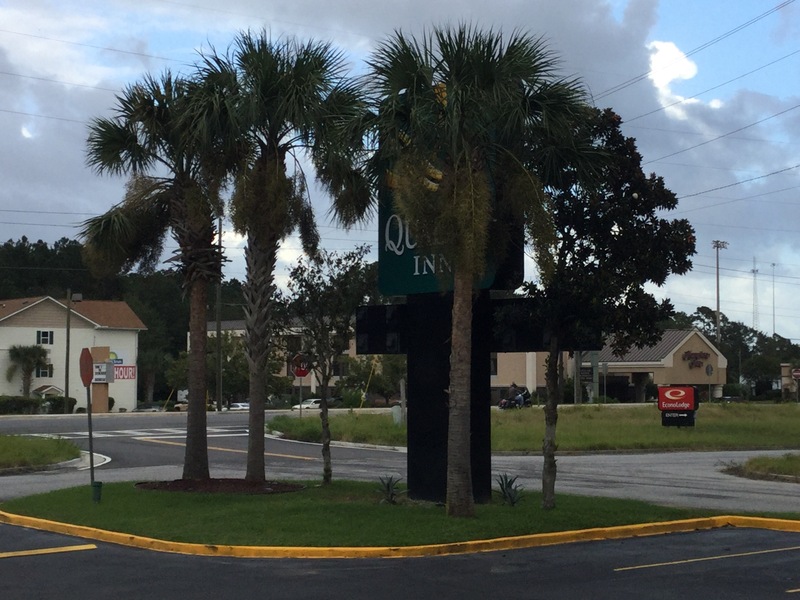 Yes friends, we’re back in the land of palm trees and Spanish moss! To get to Florida, you’ve got to do some driving. And some packing. Day one was Saturday, a relaxed drive from Maine to Burlington Vermont. Burlington – you might notice – is actually NORTH of Rockland, Maine. This seems to be our habit, this starting off in the wrong direction. 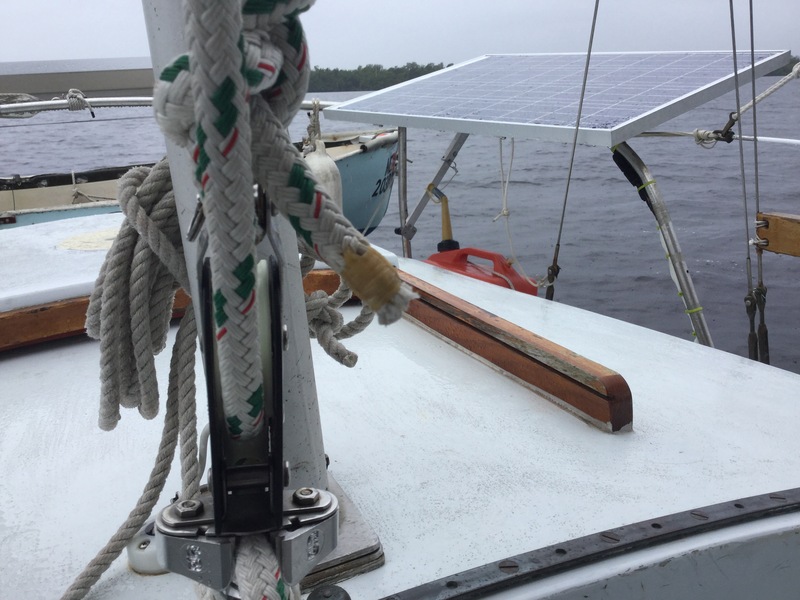 Last year we sailed from Rockland on August 18th, and spent the night in Pulpit Harbor on North Haven Island – 3 miles North of where we started. At least we’re consistent! This picture is Sionna on the mooring of her former owner in Pulpit. It’s a lovely spot, a very decent hurricane hole. Back on the road, it was on through southern NY, into Pennsylvania and watching the sun go down as we traveled, finally stopping for the night about 8:30pm in Hazelton, PA, tired, but accomplished – we’re finally moving south! Short posts written relatively frequently, ostensibly to my scattered friends and family over various seas. However, everyone is welcome and I'm honoured if you take an interest.